27 December 2001: A Happy New Year! 20 December 2001: Through imaging at infrared wavelengths, evidence has been found for recent star formation in the so-called "Pillars of Creation" in the Eagle Nebula (also known as Messier 16), made famous when the NASA/ESA Hubble Space Telescope (HST) obtained spectacular visible-wavelength images of this object in 1995. Those huge pillars of gas and dust are being sculpted and illuminated by bright and powerful high-mass stars in the nearby NGC 6611 young stellar cluster. The Hubble astronomers suggested that perhaps even younger stars were forming inside. Using the ISAAC instrument on the VLT 8.2-metre ANTU telescope at the ESO Paranal Observatory, European astronomers have now made a wide-field infrared image of the Messier 16 region with excellent spatial resolution, enabling them to penetrate the obscuring dust and search for light from newly born stars. 14 December 2001: The European Southern Observatory (ESO) has been involved in many Europe-wide educational projects during the past years, in particular within European Science Weeks sponsored by the European Commission (EC). 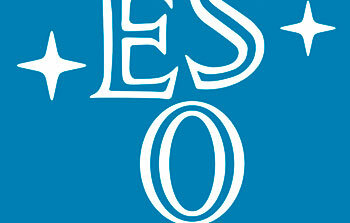 In order to further enhance the significant educational potential inherent in the numerous scientific endeavours now carried out by Europe's astronomers with ESO front-line telescope facilities, it has been decided to set up an Educational Office within the ESO EPR Department. It will from now on work closely with astronomy-oriented teachers, in particular at the high-school level , providing support, inspiration and new materials. 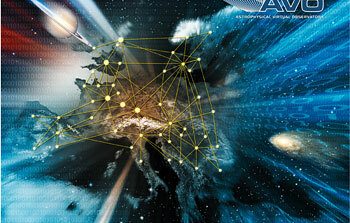 Much of this interaction will happen via the European Association for Astronomy Education (EAAE). 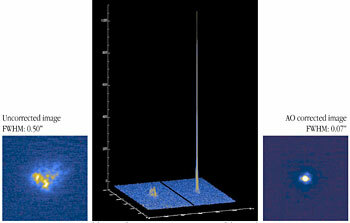 5 December 2001: An international team of astronomers  has observed a Dark Matter object directly for the first time. Images and spectra of a MACHO microlens - a nearby dwarf star that gravitationally focuses light from a star in another galaxy - were taken by the NASA/ESA Hubble Space Telescope (HST) and the European Southern Observatory's Very Large Telescope (VLT). The result is a strong confirmation of the theory that a large fraction of Dark Matter exists as small, faint stars in galaxies such as our Milky Way. 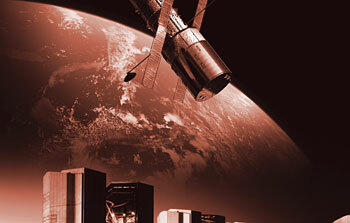 5 December 2001: The Councils of the European Southern Observatory (ESO) and the UK Particle Physics and Astronomy Research Council (PPARC), at their respective meetings on December 3 and 5, 2001, have endorsed the terms for UK membership of ESO, as recently agreed by their Negotiating Teams. All members of the Councils - the governing bodies of the two organisations - welcomed the positive spirit in which the extensive negotiations had been conducted and expressed great satisfaction at the successful outcome of a complex process. The formal procedure of accession will now commence in the UK and is expected to be achieved in good time to allow accession from July 2002. Sharpest Ever VLT Images at NAOS-CONICA "First Light"
3 December 2001: A team of astronomers and engineers from French and German research institutes and ESO at the Paranal Observatory is celebrating the successful accomplishment of "First Light" for the NAOS-CONICA Adaptive Optics facility. With this event, another important milestone for the Very Large Telescope (VLT) project has been passed. 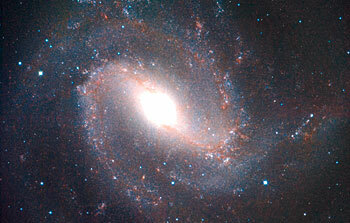 29 November 2001: Messier 83 (M83) is a relatively nearby spiral galaxy with a pronounced bar-like structure. 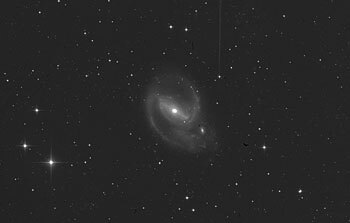 It is located in the southern constellation Hydra (The Water-Snake) and is also known as NGC 5236; the distance is approximately 12 million light-years. Images of M83 obtained in visible light - like the VLT photo published exactly two years ago - show clumpy, well-defined spiral arms that are rich in young stars while the disk reveals a complex system of intricate dust lanes. This galaxy is known to be a site of vigorous star formation and no less than six supernovae (exploding stars) have been observed in M83 during the past century. It is a fairly symmetrical object and possesses no nearby companions. 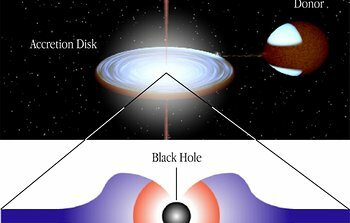 28 November 2001: One of the most enigmatic stellar systems in our Milky Way Galaxy has been shown to harbour a very massive black hole. With 14 times more mass than the Sun , this is the heaviest known stellar black hole in the Galaxy. Using the ISAAC instrument on the Very Large Telescope (VLT) 8.2-metre ANTU telescope at the ESO Paranal Observatory, an international team of astronomers  peered into a remote area of the Milky Way to probe the binary system GRS 1915+105, located almost 40,000 light-years away. 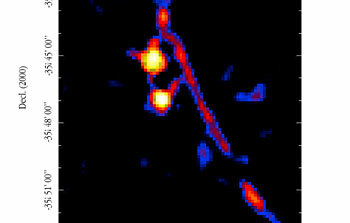 They were able to identify the low-mass star that feeds the black hole by means of a steady flow of stellar material. A detailed follow-up study revealed how this star revolves around its hungry companion. The analysis of the orbital motion then made it possible to estimate the mass of the black hole. The observation of the heavy black hole in GRS 1915+105 is opening up fundamental questions about how massive stellar black holes form, and whether or not such objects rotate around their own axes. 5 November 2001: It started as a preparatory technical experiment and it soon developed into a spectacular success. Those astronomers and engineers who were present in the control room that night now think of it as the scientific dawn of the Very Large Telescope Interferometer (VLTI). On October 29, 2001, ANTU and MELIPAL, two of the four VLT 8.2-metre Unit Telescopes at the ESO Paranal Observatory, were linked for the first time. Light from the southern star Achernar (Alpha Eridani) was captured by the two telescopes and sent to a common focus in the observatory's Interferometric Laboratory. 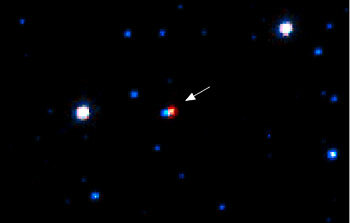 8 October 2001: A series of very detailed images of a binary system of two young stars have been combined into a movie. In merely 3 days, the stars swing around each other. As seen from the earth, they pass in front of each other twice during a full revolution, producing eclipses during which their combined brightness diminishes. A careful analysis of the orbital motions has now made it possible to deduce the masses of the two dancing stars. Both turn out to be about as heavy as our Sun. 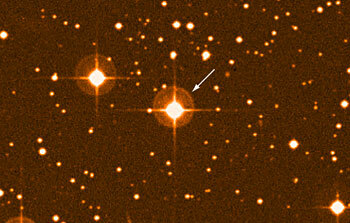 But while the Sun is about 4500 million years old, these two stars are still in their infancy. 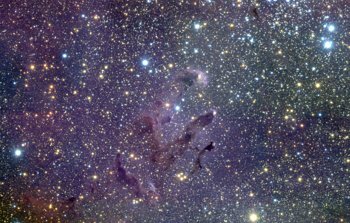 8 October 2001: Is there life elsewhere in the Universe? Are we alone? These questions have always fascinated humanity and for more than 50 years, physicists, biologists, chemists, cosmologists, astronomers and other scientists have worked tirelessly to answer these fundamental questions. And now this November via webcast, all the world will have the opportunity to see and hear the latest news on extraterrestrial life from the most prestigious research centers and how for the past three months, European students have had the chance to jump into the scientists' shoes and explore these questions for themselves. 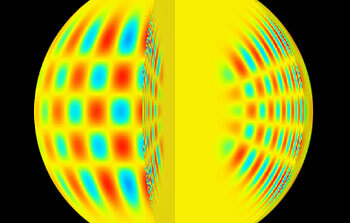 30 August 2001: A new instrument, SIMBA ("SEST IMaging Bolometer Array"), has been installed at the Swedish-ESO Submillimetre Telescope (SEST) at the ESO La Silla Observatory in July 2001. 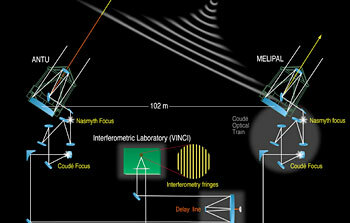 It records astronomical images at a wavelength of 1.2 mm and is able to quickly map large sky areas. In order to achieve the best possible sensitivity, SIMBA is cooled to only 0.3 deg above the absolute zero on the temperature scale. 22 August 2001: Very high abundances of the heavy element Lead have been discovered in three distant stars in the Milky Way Galaxy. This finding strongly supports the long-held view that roughly half of the stable elements heavier than Iron are produced in common stars during a phase towards the end of their life when they burn their Helium - the other half results from supernova explosions. All the Lead contained in each of the three stars weighs about as much as our Moon. The observations show that these "Lead stars" - all members of binary stellar systems - have been more enriched with Lead than with any other chemical element heavier than Iron. This new result is in excellent agreement with predictions by current stellar models about the build-up of heavy elements in stellar interiors. The new observations are reported by a team of Belgian and French astronomers  who used the Coude Echelle Spectrometer on the ESO 3.6-metre telescope at the La Silla Observatory (Chile). 14 August 2001: Supermassive Black Holes are present at the centres of many galaxies, some weighing hundreds of millions times more than the Sun. These extremely dense objects cannot be observed directly, but violently moving gas clouds and stars in their strong gravitational fields are responsible for the emission of energetic radiation from such "active galaxy nuclei" (AGN). A heavy Black Hole feeds agressively on its surroundings. When the neighbouring gas and stars finally spiral into the Black Hole, a substantial fraction of the infalling mass is transformed into pure energy. However, it is not yet well understood how, long before this dramatic event takes place, all that material is moved from the outer regions of the galaxy towards the central region. So how is the food for the central Black Hole delivered to the table in the first place? To cast more light on this central question, a team of French and Swiss astronomers  has carried out a series of trailblazing observations with the VLT Infrared Spectrometer And Array Camera (ISAAC) on the VLT 8.2-metre ANTU telescope at the ESO Paranal Observatory. 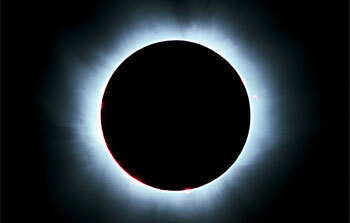 1 August 2001: The solar corona is a beautiful sight during total solar eclipses. It is the uppermost region of the extended solar atmosphere and consists of a very hot (over 1 million degrees), tenuous plasma of highly ionised elements that emit strong X-ray radiation. There is also a much weaker coronal emission in the optical part of the spectrum. The Sun is a normal star and X-ray observations from rockets and orbiting X-ray telescopes have shown that many other stars also possess coronae. But due to observational limits of the telescopes available so far, the much fainter optical emission from stellar coronae had never been detected. 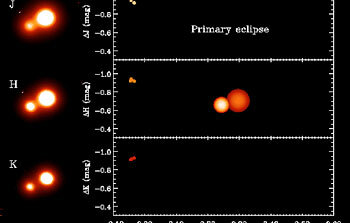 Now, however, an optical coronal line from iron ions that have lost 12 electrons (Fe XIII) has for the first time been observed in a star other than the Sun. The object, a cool star named CN Leonis, is located at a distance of 8 light-years. This impressive observational feat was performed with the UV-Visual Echelle Spectrograph (UVES) on the VLT 8.2-metre KUEYEN telescope at the ESO Paranal Observatory, within a programme by German astronomer Jürgen Schmitt and his collaborators at the University of Hamburg Observatory. 2 July 2001: The Universe is indescribably huge. Can it be possible that Humanity is the only form of intelligent life which exists in all this immensity? Are we really alone? Throughout history there have been sightings of creatures from elsewhere. Science fiction novels and films with flying saucers and bizarre looking aliens are part of our general culture. Perhaps the Earth is really only an experiment designed by mice and soon we will all be destroyed to make way for a new interstellar highway! The possibility that there is life in the Universe has always excited the general public and scientists are equally enthusiastic. Physicists, biologists, chemists, cosmologists, astronomers are researching all over Europe to try to answer this age-old question: Is there life in the Universe? 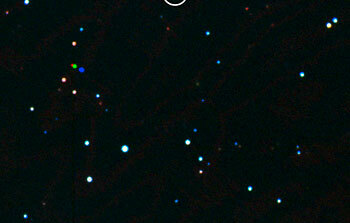 7 June 2001: An international team of astronomers  is announcing today the discovery of dusty disks surrounding numerous very faint objects that are believed to be recently formed Brown Dwarfs in the Orion Nebula . This finding is based on detailed observations with SOFI, a specialised infrared-sensitive instrument at the ESO 3.5-m New Technology Telescope at the La Silla Observatory. It is of special interest because it sheds light on the origin and nature of substellar objects, known as "Brown Dwarfs". In particular, these results suggest that Brown Dwarfs share a common origin with stars and that Brown Dwarfs are more similar in nature to stars than to planets and, like stars, have the potential to form with accompanying systems of planets. 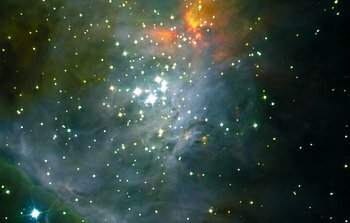 Moreover, the presence of dusty protoplanetary disks around the faintest objects in the Orion Nebula cluster confirms both the membership of these faint stars in the cluster and their nature as bona-fide substellar objects, making this the largest population of Brown Dwarf objects yet known.